"In unthinkable circumstances, should hope be offered?" When Jessica was pregnant with Namine, we were offered no hope. On the contrary, we were promised death. Our daughter, doctors assured us, would die. It would be better — “a mercy,” they called it — to abort her. If we wished, we were also offered the option of letting her be born, making her as comfortable as possible, and simply letting her body do what it would. This euphemism meant, of course, letting her die. To say that we were not given hope is no exaggeration, it is the plain truth. But we were not without hope. Even in the face of our daughter’s death — whether it was certain or not — we would not end her life prematurely. We would see her face, hold her hand, even if for only a moment. We would look upon her and tell her that she was ours, even if it cost us bitter heartbreak. As Namine grew in the womb, update after update of her health only worsened. The complications piled up: caudal regression syndrome, scoliosis, clubfoot, Pierre Robin sequence, micrognathia, double-inlet left ventricle heart defect. On and on, with no hope — only more bad news for our daughter, yet unborn. There is no hope for her, we were told. Even if she lives through delivery, her heart will not keep her alive. She will live two weeks, maybe a month. Think about quality of life. I’ve written countless times on Namine’s progress. She did not die. She has not failed to thrive, despite all the doctors’ worries. She might have, though. The risk was there, and we cannot deny it. So the question is, should we have been given hope, in light of what might have been? We certainly could have used a little hope. To constantly be told over and over (though not unkindly) that there is no hope for your child’s life is draining. More importantly, it is possible to have hope and know the very real risks involved. We never shied away from the truth. We heard it, understood it (to the best of our non-medical, layperson abilities), and worked to learn all we could about the related complications and what it would mean for our daughter’s life. In the most unthinkable circumstances, I believe that parents can hear the truth and still have hope. It isn’t the doctor’s job to give hope, but the truth. But if any possibility exists, they should give it — and that possibility is hope. Namine’s doctors were obviously wrong. She lives; she thrives. She loves music; art; reading; dancing. In spite of all the complications she’s fought against — and fights against still — she has hope of her own. 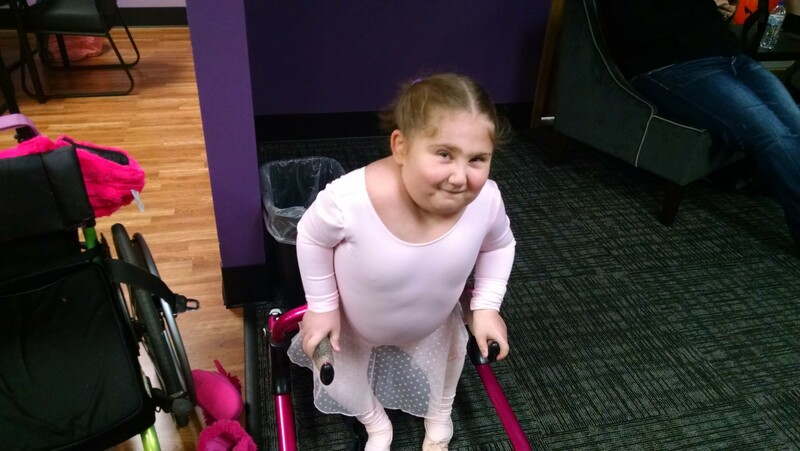 She hopes to walk, and not only hopes, but works for it. She hopes for a life made better, and she will be the one to make it so. Well done, Paul. I’m glad my post inspired your blog post. I love the look of determination in Namine’s eyes in the picture. And, I certainly resonated with your story and can very much relate. Hi Paul. I just found your site. My husband and I were given the same prognosis for our daughter. The story of the pregnancy sounds almost identical. She was diagnosed with 2 forms of Trisomy 9, Dandy-Walker syndrome, hydrocephalus, and 2 heart defects before she was born. She just had her 5th birthday and she’s thriving as well. The doctors gave us medical facts. We understood, but we didn’t want to end her life prematurely either. Yes, there are challenges, but our daughter is writing new chapters in medical journals so doctors can site our daughter as a glimmer of hope to another family facing a similar diagnosis with such odds against them. Thanks for letting me know that we are not alone.